Hiatus again yes … sorry for the tumbleweed – I recently became an Auntie so life has been super exciting! … been focusing on my pole goals … AND change of season means I’ve been hit with the flu + chest infection … you name it! 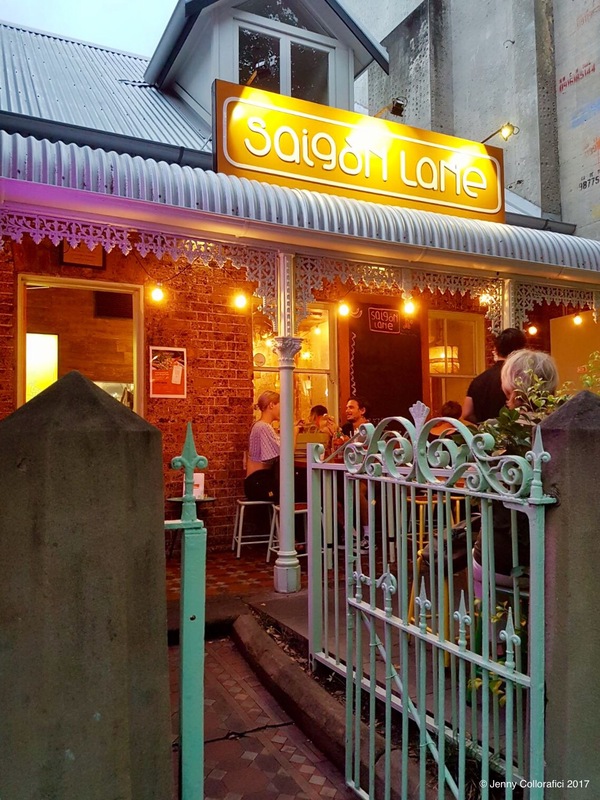 Formerly occupied by MissChu – the company was overtaken & rebranded with a refreshed menu end of last year – welcome to Saigon Lane. The menu was plentiful and has a nice selection to choose from! So let’s kick start with the cocktails (we had a choice from 2 on the menu and decided to try one of each) – both were very similar in taste & spices & had that refreshing zing! The pink grapefruit was actually sweeter (I wasn’t expecting that as I don’t like grapefruit bitterness) and the presentation was just so fun, eclectic & elegant. • Saigon G&T – gin, spiced syrup, juniper syrup & spice bitters, tonic, lavender bitters & tonic syrup. 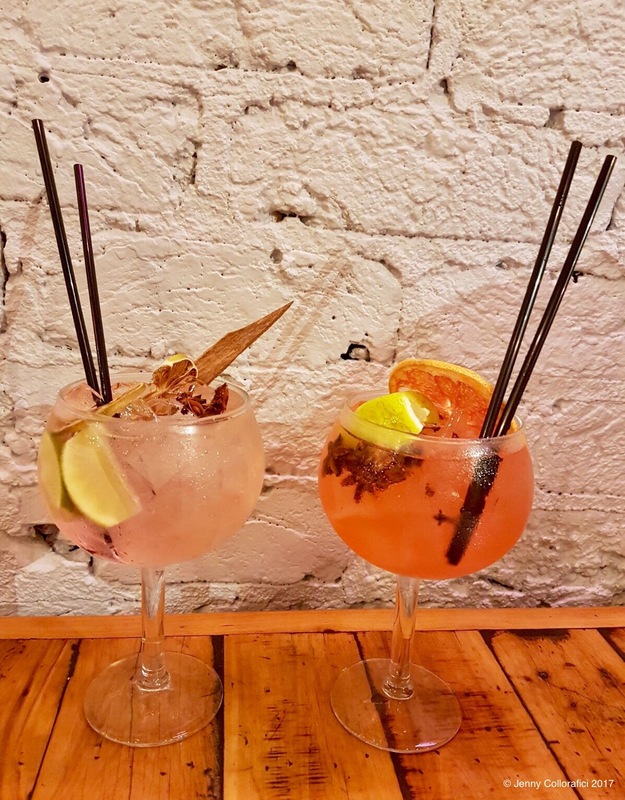 • Spice Pink Grapefruit G&T – grapefruit syrup, tonic syrup, gin, spiced syrup, tonic and strained pink grapefruit. For the entree/starters we were able to select from rice paper rolls and baos as well! Most definitely my favourite entree dish was the Green Rice Fried Tiger Prawns with sriracha mayo, lettuce wraps & fragrant herbs. Just look at the puffs of rice coating the prawn! The trick is to grab a lettuce cup, some stems of fresh herbs and envelope the prawn inside. 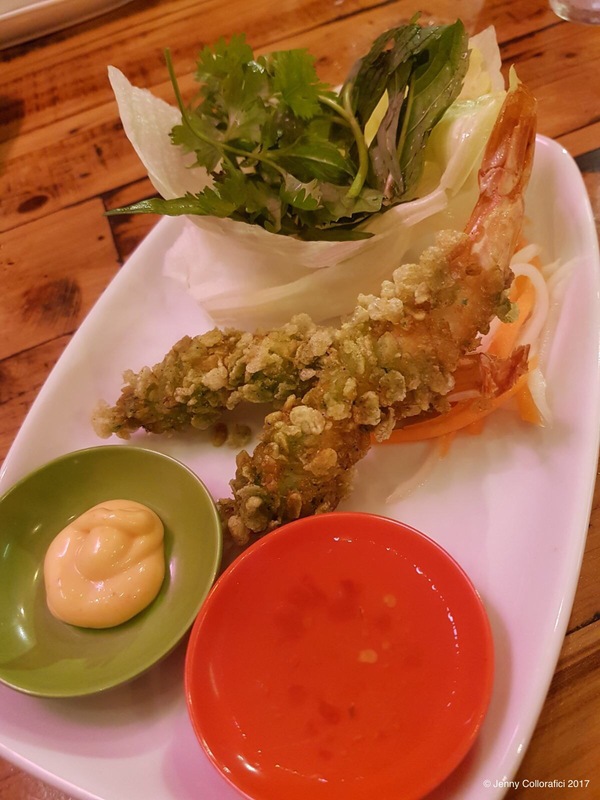 Carefully dip in the mayo & sauce – WOW – I love the freshness of the greens but then the crunch of the puffed rice & finish with the bite of the juicy prawn. Not to say that there aren’t amazing dishes because there truly are! 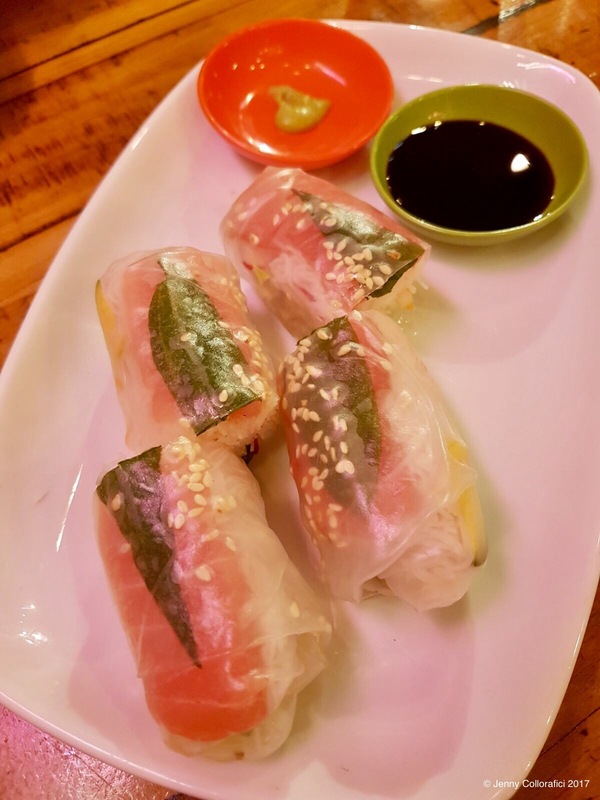 We also enjoyed the “Roll up, Roll up” rice paper rolls – Slice raw Tuna, pickled vegetables, vermicelli, lettuce, sesame seeds, coriander, mint & soy wasabi dressing. First word: freshness … The flavour combo was simple & just worked … and really love the fact that the tuna was a nice generous chunk. 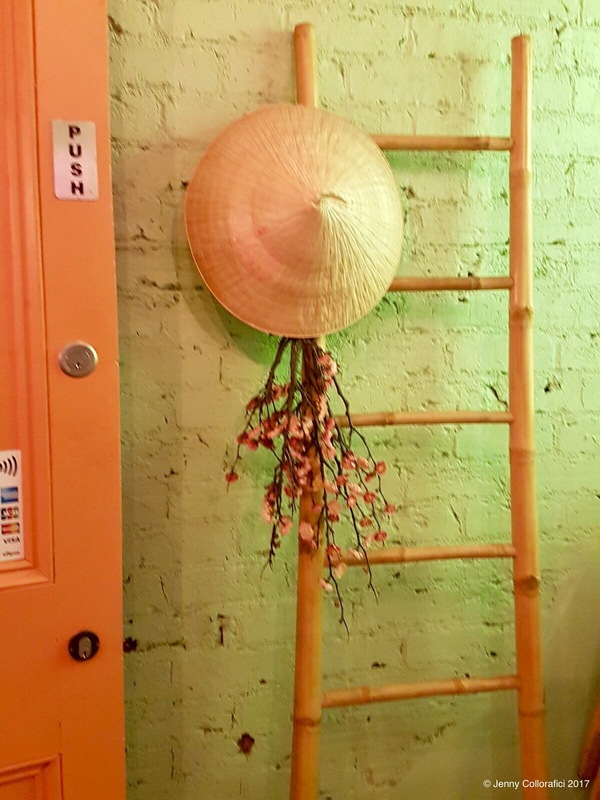 Bow to the Bao! I love baos … For those of you who don’t know what that is, it’s a soft, fluffy steamed bun that looks like a butterfly shape – stuffed with all sorts of ingredient goodies! 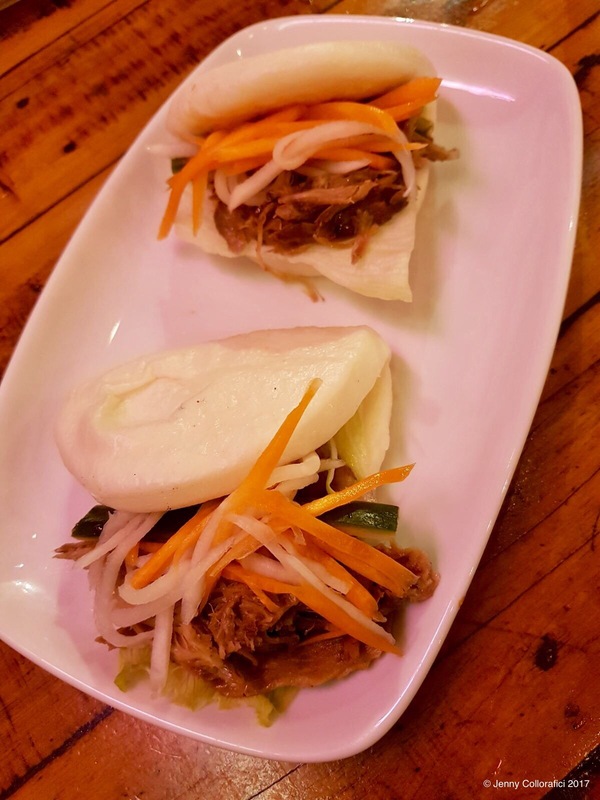 Vietnamese Pulled Duck with hoisin, pickled vegetables & herbs. Meanwhile look at this bao – overfilled & plentiful. The soft bun is not chewy & melts in your mouth so you can taste the delicate duck & zing of pickled vegetables. Must have mains – to share of course! … Hello Pork Hock! 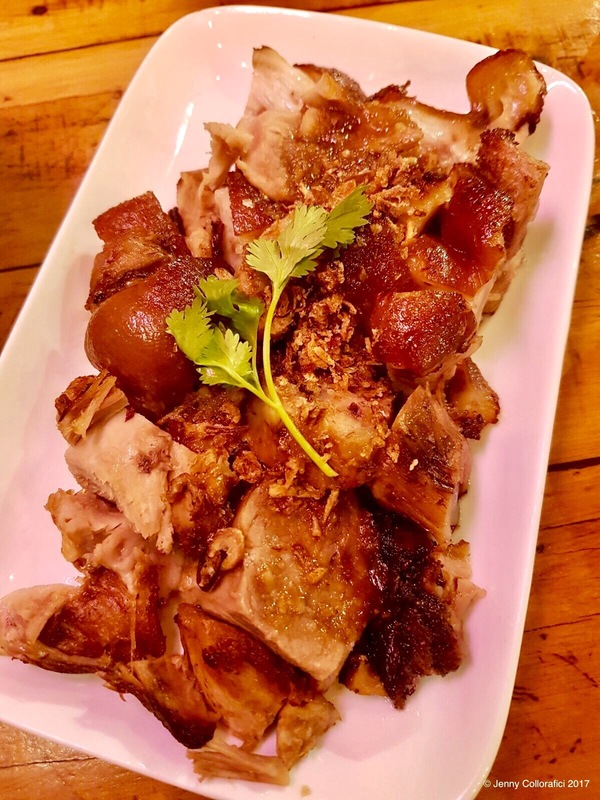 Crispy Pork Hock with sweet sour glaze, crispy shallots, coriander & red rice … Succulent pork? CHECK … Crispy Skin? CHECK … Melt in your mouth? CHECK … The red rice has a nice neutral balance with a nice bite (reminded me of brown rice) to the richness of the pork. 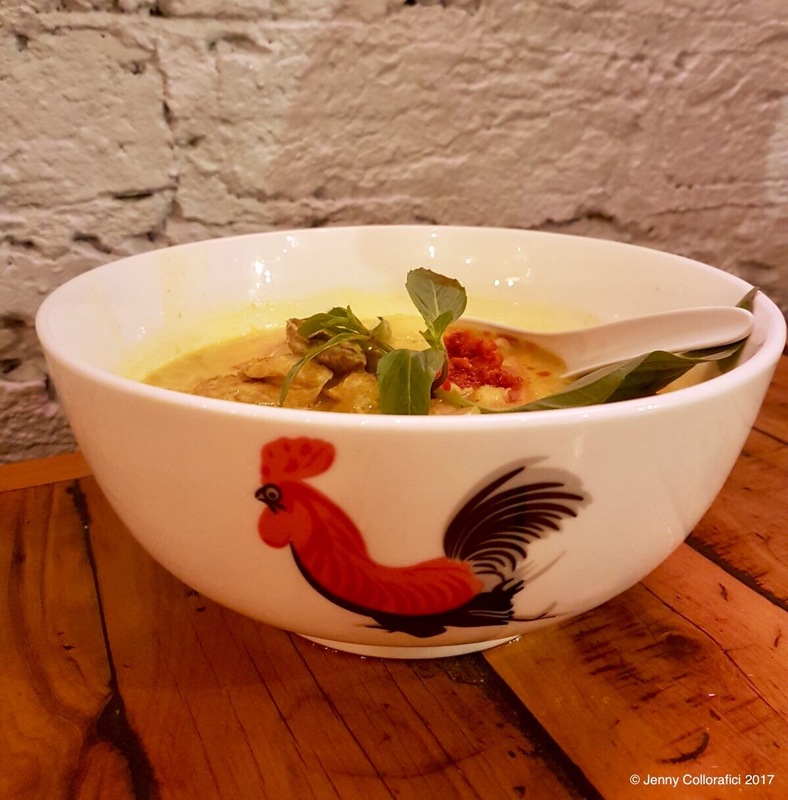 I love a delicious curry and note that I am very fussy … It can’t be too spicy … Too heavy … Chicken Curry with vermicelli noodles, long beans, mushroom, chilli jam & herbs. Hands down was one of the best curries I’ve ever had & enjoyed. It gave me childhood memories of yellow curry flavours.. The chicken was cooked tender, the thin vermacelli noodles were light & delightful to slurp, the addition of vegetables were well balances (especially the mushrooms – had a burst of curry sauce with ewach bite). This was a perfect meal. 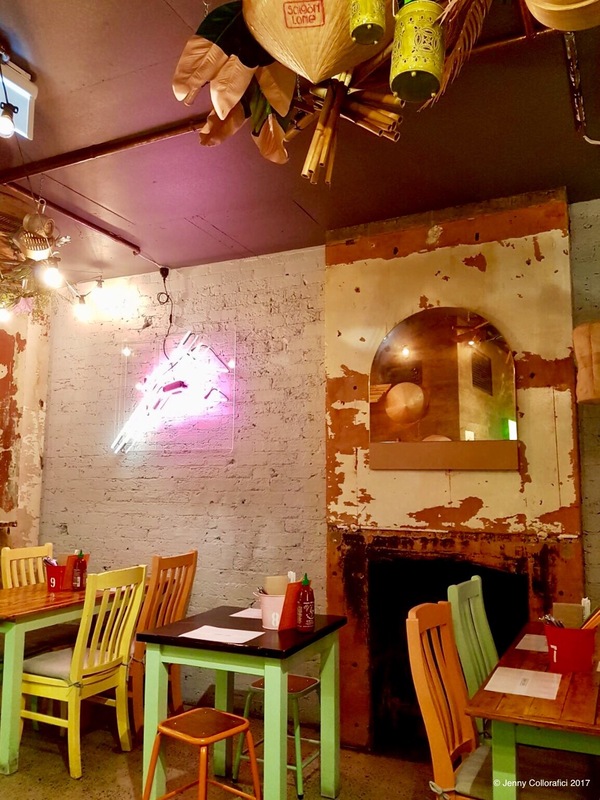 FINALLY the best part of a meal & the menu … Dessert … When it comes to Asian-fused flavours, you will either love it or think it’s a little bit odd. At the time as I couldn’t decide what to have, in my usual style I ordered two for variation & options. 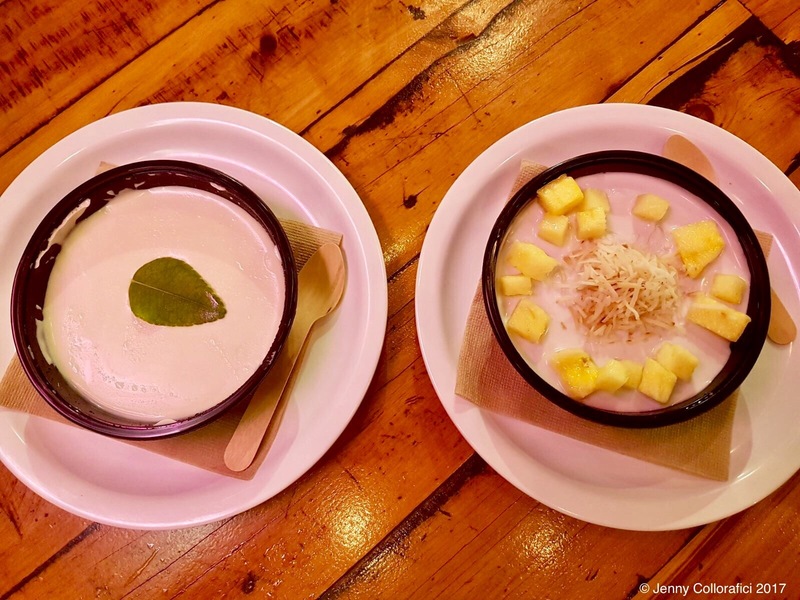 • Coconut Tapioca with Toasted Coconut & topped with seasonal fruits – I love tapioca & the texture of the little soft chewy bursts with the hint of coconut … topped with fresh pineapple and toasted crunch of coconut shreds. • Lemongrass & Lime Leaf Pannacotta – this dessert is something you would be either love or hate. Pannacotta is one of fav desserts – this one was smooth & silly in texture with the dabbles of lemongrass & lime leaf. 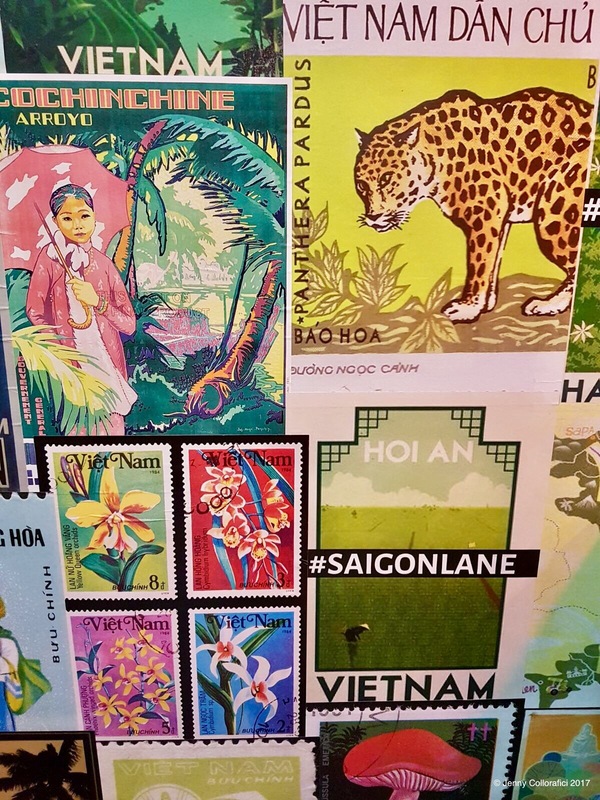 It’s very sad to see one of my new favs leave so soon – after all the rebrand only took place late last year … however I am hoping that Saigon Lane will cross paths again soon! Stay tuned readers for more food adventures plus my creative carrot cake recipe that you will love!